One the students in my Virginia class was describing African American students in 19th century Virginia who had to wrap their feet in guano bags to keep warm in the winter. Nobody knew what these were, and it launched a discussion of the meaning of 'guano' in VA and the South more broadly. No, it isn't too hard to get me talking about guano...the short answer is that "guano" became the universal term for fertilizer long after it was actually real guano. I never ended up bringing a guano bag into class before the semester ended, so as promised I am posting a picture of one. 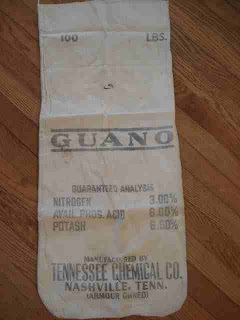 This is from Tennessee, a 100 pound guano sack. It looks small in the picture, but it is almost three feet long.